His scheduled appearance comes just two weeks before he faces what will be his toughest election battle since 1999, when he lost an election to Ehud Barak, then the leader of the Labor Party (מפלגת העבודה הישראלית). Sure, the furor over the US-Israeli relationship is making headlines in Israel as well as in the United States. But Netanyahu is betting that the media storm over his audacious plan will recede within days. By the time Netanyahu actually comes to Washington, the coverage will be rosier, especially among the Tel Aviv and Jerusalem media just days before Israelis elect a new Knesset on March 17. Even if the coverage isn’t entirely positive, the visual in the Israeli media for 24 to 48 crucial hours in early March will still be Netanyahu receiving applause from Republican and Democratic legislators alike in arguably the world’s most important legislative chamber. Though Netanyahu may be a persona non grata to an increasing number of Democratic and even Republican politicians, it’s not clear that he really cares what anyone in the United States thinks of him. Besides, for every dovish, left-leaning Haaretz reader who agrees that Netanyahu is overstepping diplomatic lines, there’s certainly at least another voter (or two) who will see an Israeli prime minister not afraid to step on some toes while lecturing the Obama administration on what Netanyahu believes represents an existential challenge to Israeli security. With the Israeli political scene so fragmented, Netanyahu doesn’t need to win over a huge number of voters to remain prime minister. Polls today, however, show that Netanyahu is locked in a tough two-way fight with Labor, under the untested leadership of Isaac Herzog, who joined forces with the moderate center-right Tzipi Livni, until recently justice minister in Netanyahu’s previous government. Voters who are leaning to the Labor/Livni ticket are not likely to change their minds anytime soon. Polls currently Netanyahu’s center-right Likud (הַלִּכּוּד‎) around 23 to 26 Knesset seats and Labor/Livni between 22 and 24. But that’s not even half of the 120 slots that are up for grabs. Netanyahu instead hopes to peel away votes from the nationalist and religious right in his own country and shoring up support from Likudniks, many of whom feel Netanyahu’s expiration date is nearing. Former interior minister Gideon Sa’ar came close to challenging Netanyahu for the Likud leadership in late December. Other former Likud moderates (including Israel’s former ambassador to the United States, Michael Oren, who has been especially critical of Netanyahu’s speech) have left Netanyahu to support former communications minister Moshe Kahlon, whose new centrist Kulanu (כולנו‎) could win around eight or nine seats. Netanyahu’s former chief of staff and prickly economy minister Naftali Bennett, who leads the more conservative Bayit Yehudi (הבית היהודי, ‘The Jewish Home’), could win another 15 or 16 seats. Netanyahu’s longtime foreign minister Avigdor Lieberman, who leads the nationalist Yisrael Beiteinu (ישראל ביתנו‎, ‘Israel is Our Home’) could win between four and seven seats. That’s a lot of fertile territory on the Israeli right, and that’s without poaching a single vote from Israel’s ultraorthodox haredim parties, which typically win between another 10 to 20 seats in the Knesset. Going to Washington to speak hard truths to US complacency plays well among those voters, and it will make Netanyahu seem like a statesman against Bennett, Lieberman and Kahlon, who will all likely be Netanyahu’s future coalition partners if Netanyahu wins a third consecutive mandate. As Goldberg and others note, the long-term risks to the bilateral relationship are not imaginary. Nevertheless, Obama is in the final quarter of his presidency and, despite his defiant State of the Union address last week, he faces a hostile congressional opposition. Moreover, attention will gradually slip towards the 2016 presidential race and away from Obama in the months ahead. If a Republican like Romney, former Florida governor Jeb Bush, Wisconsin governor Scott Walker or New Jersey governor Chris Christie wins, Netanyahu will once again be the darling of the American executive branch. If Democratic frontrunner and former US secretary of state Hillary Clinton wins, Netanyahu can take some satisfaction in knowing that he’ll be working with a president who once represented one of the most pro-Israeli constituencies in the United States as a New York senator for eight years, as well as someone who has criticized the Obama administration, however gently, for needlessly antagonizing Netanyahu over the last six years. For Netanyahu, though, it won’t matter who replaces Obama next year if he can’t make it to a fourth term as prime minister next month. If Netanyahu steps down in 2018 or 2019 having served as handmaiden to a tough nuclear deal between a Bush/Walker/Christie administration and Iranian president Hassan Rowhani, that’s more important to Netanyahu’s legacy than years of sniping with the Obama administration. All politics is local, as former House speaker Tip O’Neill once said. Even when those politics reverberate across an ocean, the maxim still holds true. The real audience isn’t in Washington, it’s in Jerusalem. Wrong. Israelis don’t need convincing about Iran. 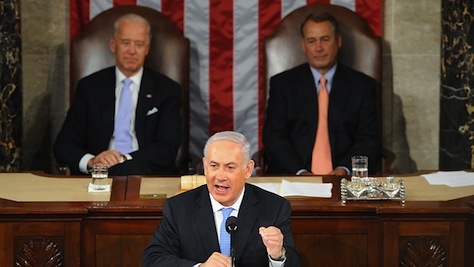 Left, Right and Center we support Mr. Netanyahu’s efforts to explain the Iran issue to the world. Thank you Mr. Lees, for writing something intelligent about Bibi Netanyahu’s motivations. His judgment over the past 6 years has proven to be spot on correct about where things are going in the MidEast. In contrast, the judgment of Mr. Obama – who Jeff Goldberg merely parrots – has proven to be disastrous across the board. I am amazed that these people still want to give speeches to Bibi about how he should behave. Their favorite Arab dictators are all going down, including quite soon Mr. Moderate Mahmoud Abbas.